Stars shine over rock formations in Petrified Forest National Park, with the dim glow of Holbrook, Arizona, on the horizon to the west. Photo by Jake Holgerson/NPS. The National Park Service and IDA are pleased to announce that Petrified Forest National Park has been officially designated as an International Dark Sky Park. An IDA International Dark-Sky Park (IDSP) is a land possessing an exceptional or distinguished quality of starry nights and a nocturnal environment that is specifically protected for its scientific, natural, educational, cultural heritage, and/or public enjoyment. 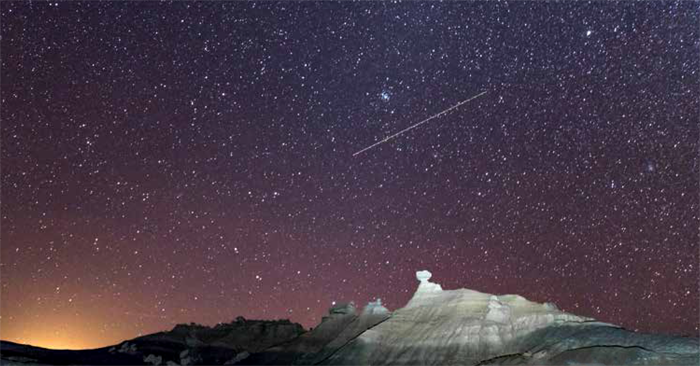 As such, Petrified Forest National Park joins an exclusive but growing list of certified IDA International Dark-Sky Parks. Achieving official Dark Sky Park status is an extensive process, and park staff worked for years to gather and interpret night sky data, make lighting retrofits, meet all criteria for official IDA designation, and prepare the 100+ page application. In honor of International Dark Sky Park designation Petrified Forest National Park will celebrate this fall with a star party, valued partner Petrified Forest Field Institute is planning to ramp up night-sky related programming, and visitors who backcountry camp in the park’s Wilderness areas continue to have nightly access to the park’s dark skies.